At (PC3):Worship, our belief is that worship brings healing, cleansing, and strength. It brings us face to face with our loving father, and should move us into such a place of intense passion and love for our Lord that we could bask in His presence for hours. We are commonly challenging ourselves and the congregation to embody just what the caption is on the above picture. 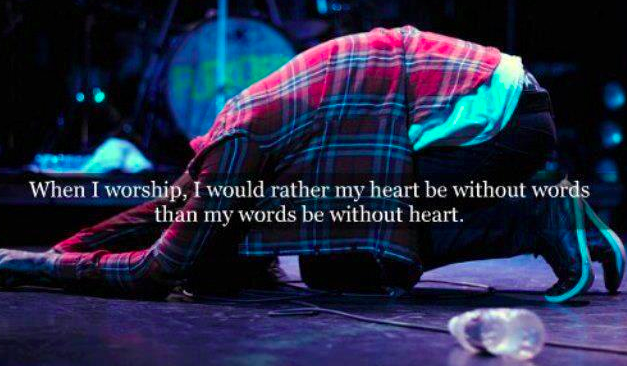 That our hearts be open before Him, rather than simply sing the words and fail to internalize their meaning. We believe that our worship should be passionate, meaningful, and authentic. We believe worship should be intimate. From a more technical perspective, we are a contemporary worship band that endeavors to have musical excellence, while flowing in and following the leading of the spirit. Currently, our team consists of vocalists, pianists, guitarist, bass players, and drummers. For more information on becoming part of the PC3 Worship Team, please email our Worship Director, Judah Baker!